I got up early yesterday, well before the dawn. It was amazingly cold outside. The Weather Channel had predicted 19 degrees below zero when I went to bed (with all my clothes on). There was ice riming the inside of my living room windows. If I drove west for a little more than an hour, I'd be at Mount Washington, in New Hampshire. You don't have to drive too far past it, continuing west, to be in Vermont. Mount Washington is famous for bad weather, and people squat on top of it pretending to be scientists or something, but are really just human beings, and so find extreme things interesting and want to look at them when they should be working. We drove past Mount Washington almost a year ago, delivering a truck freighted with the ghosts of our belongings to a charming town in New Hampshire called Littleton. We saw a big, brown head poking out of the puckerbrush by the side of the road, lumpenly watching us go by, and knew we were in a wild place. I would have gotten a picture, but the poor beast was frightened by the squeal my wife made --even a car buttoned up for sub-arctic weather cannot contain such a thing --and lumbered off to look for quieter neighbors. I doubt he found them on Mount Washington. They're always squealing up there, I imagine. 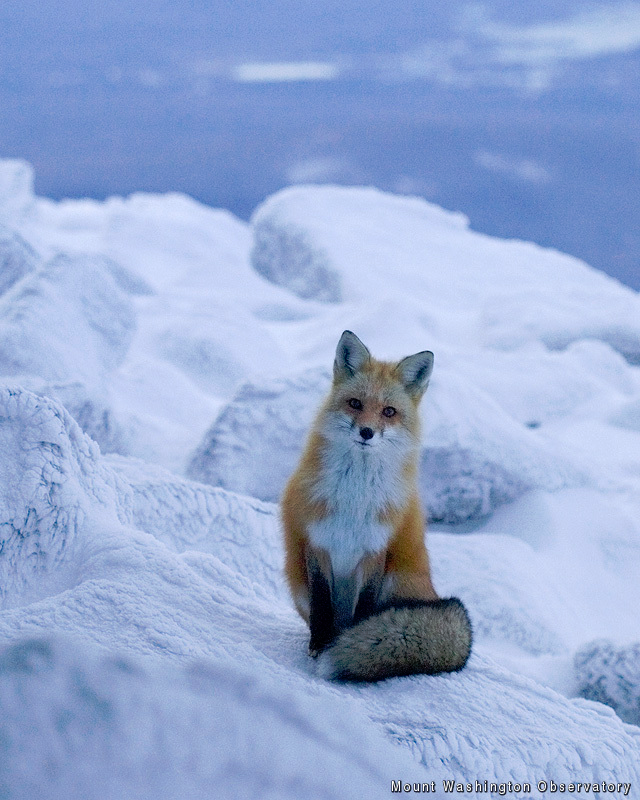 Whoa, now that's a pretty fox. Much handsomer than the sole fox around the Seppofarm these days, it seems the coyotes are competing too much in fox territory for food and beauty shop treatments. Yes, Mt Washington is incomprehensible to comfy-minded flatlanders. We are seeing more and more red foxes here in Lancaster County. Maybe because so much of the land is being developed, they are moving, too. Hi Kenneth- It's too cold to crouch in everybody's bushes and peek in their windows so I can't determine if you're on to something. Jewel- "so much land is being developed" Not so. The amount of land in the Northeast that is forested has increased a great deal over the last century. It used to be farmed.